Meat Standards Australia (MSA) is a grading system developed to improve the supply of consistently high quality meat to the beef consumer. MSA is a ‘tenderness guaranteed’ grading program that grades beef based on eating quality. MSA was developed using consumer taste tests of beef produced over a wide range of cattle breeds, management practices, processing systems, ageing periods and cooking methods for the main cuts of meat. The MSA system grades each muscle (cut) on eating quality, with regards to tenderness, juiciness, flavour and overall liking. The grade can be 3, 4 or 5 star and each cut is labelled accordingly. MSA certified graders assess carcase attributes collected during processing using a uniform set of standards, and collate information provided by the beef producer, which is then entered into a computer program. Results of grading are allocated to the carcase to produce a MSA score, and a grade is allocated to different cuts along with days of aging required to achieve the grade and the suggested cooking method. MSA licensed processors ensure all their systems comply with MSA program requirements. The key factors are pre-slaughter handling, processing treatments, carcase grading by a MSA certified grader and product labelling. Producing MSA beef is an option for beef producers particularly those supplying the domestic market. Producers who wish to supply MSA beef need to be registered. To register as a MSA producer complete a MSA registration form. Forms can be obtained by phoning 07 3620 5200 or at Meat Standards Australia Producer Training. The on-property or feedlot management of beef cattle is a critical element contributing to the eating quality of beef. Producing MSA beef does require meeting certain standards and requirements. Be handled and mustered quietly to reduce stress. Females must not be pregnant or have previously calved. Have free access to water until dispatch. Have free access to feed until dispatch, other than a minimum period required for preparation through cattle yards. Be continually grazed or fed rations to a level that is adequate for growth for a minimum period of one month prior to dispatch. Do not consign any cattle of poor temperament or with signs of severe stress. Do not consign sick cattle or cattle within a withholding period for any treatment. Do not mix cattle from different mobs or pens on the property within two weeks of dispatch. Do not dispatch cattle purchased or moved from another property/saleyard within one month of arrival. Load cattle quietly, preferably with no use of goads and electric prodders. Load cattle at the recommended densities as set out in the trucking industry code of practice. A MSA vendor declaration and a National Vendor Declaration must accompany the cattle to the MSA licensed abattoir. The MSA vendor declaration confirms that MSA guidelines for cattle handling and trucking have been followed and that tropical breed content and HGP treatment is recorded. To be eligible for MSA grading cattle consigned must meet the MSA licensed processing company specifications for grading. These specifications include weight, dentition and P8 fat depth parameters. 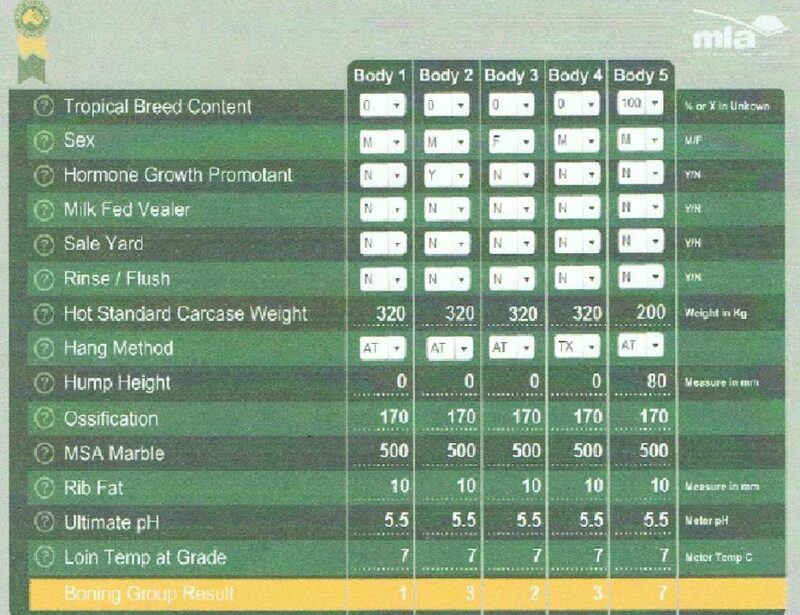 All breeds are eligible for MSA grading, however high tropical breed content can impact on eating quality and therefore, the level of grading achieved. An MSA Boning group is computer calculated for carcase cuts from measurements taken by the certified MSA grader and from information supplied on the MSA vendor declaration form. MSA assigns numbers to cuts that share similar eating qualities or grading outcomes. These numbers represent Boning groups and are used to allow the boning room to utilise cuts from similar bodies during packing. Boning groups range from 1-18 and U, where U represents ungraded carcases. Boning group numbers descend in quality, where boning group 1 represents the group having the highest quality grading outcomes. MSA feedback is provided to producers for cattle which have met company specifications and then have been allocated a MSA Boning group, or are ‘ungraded’ (U). This feedback is also available online at www.msagrading.com.au. Click on the feedback and benchmarking login button. why carcases received a low, medium or high boning group score. This will point to where changes in management that can be made to increase MSA compliance rates and decrease Boning group scores. increasing the percentage of cattle receiving a premium (i.e. in a lower Boning group). increase rump fat, rib fat cover and marbling through genetic improvement. The Meat Standards Australia website also includes a MSA Grading Calculator that can be used by registered MSA producers and is found at Meat Standards Australia Login. When opened the grading calculator looks like the image below. Just select an option or enter a score for each parameter (e.g. hump height, ossification) and then click the calculate button. This calculator gives an indication of the scores that are required to achieve targeted Boning groups. For example lower (i.e. better) boning groups will be achieved with lower ossification, lower hump height, higher carcase weight, higher MSA marble and rib fat scores. Detailed information is available from Meat & Livestock Australia at Meat Standards Australia | Meat & Livestock Australia. Felicity Hamlyn-Hill and Alan Laing, formerly Queensland Government. how the new MSA transport protocol is likely to benefit producers in more remote areas that currently cannot access MSA premiums. Hear from MSA pathways coordinator Rod Polkinghorne and far western Queensland beef producer Cameron Daley, with hosts Jon Condon (Beef Central) and John James (FutureBeef). They will outline the findings of the recent MLA-funded research; the conditions that apply under the new transport protocol; and offer some insight as to how the new standard may be applied under commercial conditions for remote producers. Join our presenters as they discuss these topics in this webinar recording. For your convenience, here are the webinar presentation slides (PDF, 924KB). 50:00 minutes published 30 July 2013 by FutureBeefAu.